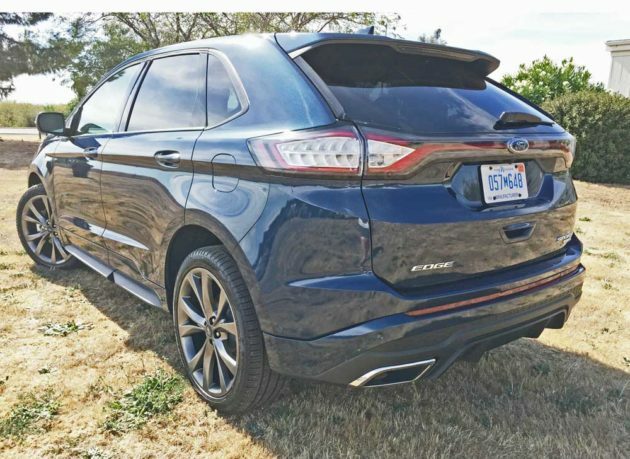 ?2017 Ford Edge Sport AWD? 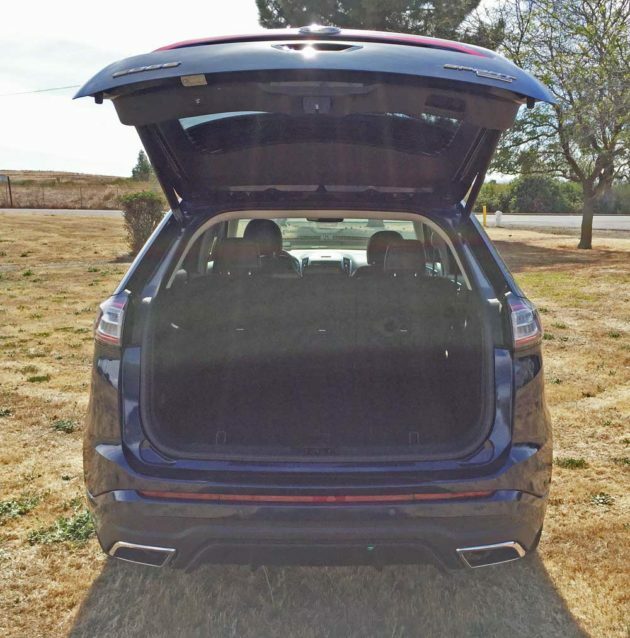 The original Crossover Utility vehicle from the Blue Oval team Ford Edge was the Ford Edge, which was launched late in 2006 and has continued to gain progressively in popularity, becoming the proven leader in its category. 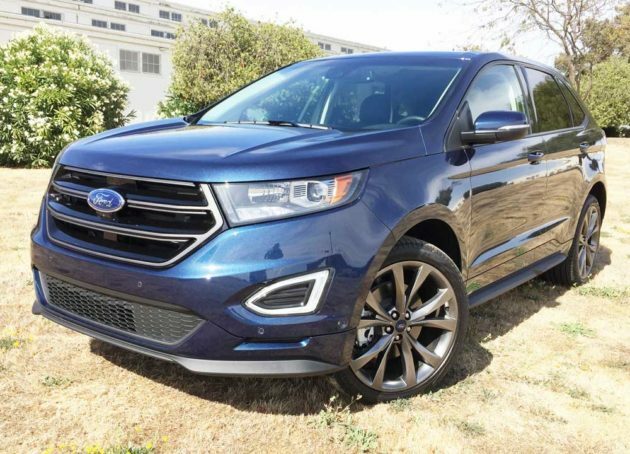 This year, the 2017 Ford Edge Sport offers more technology, a higher degree of craftsmanship and enhanced driving dynamics. 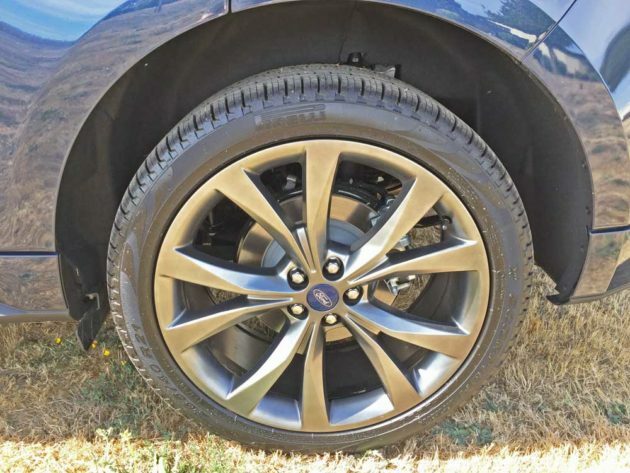 Edge will be offered in four levels of trim: the base SE; the SEL Edge; Edge Titanium and the top-of-the-line model, the Ford Edge Sport. 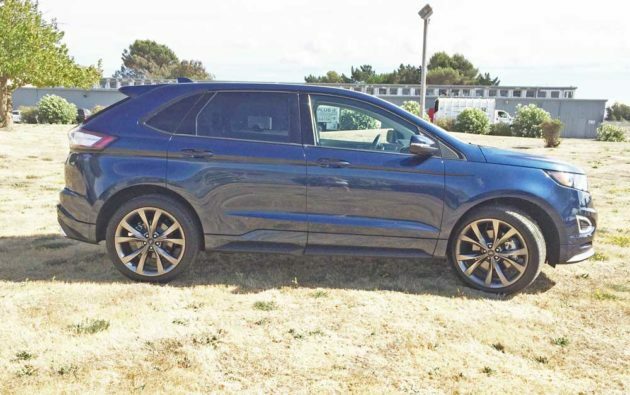 Pricing starts at $28,700 plus $895 to $40,900 for the Ford Edge Sport plus the $895 for Destination. The Titanium model joined the lineup in 0215 replacing the old Limited trim. It?s anticipated that the Edge in SEL trim will be the volume sales leader even though the Edge Sport is more upscale and offers more features and equipment. 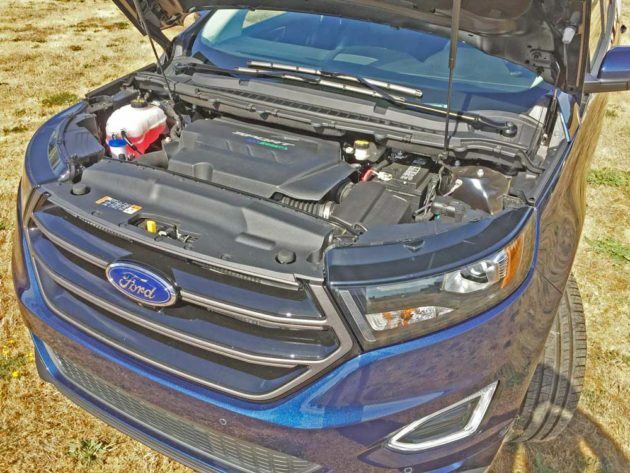 The 2017 Ford Edge will draw its power from one of three engine choices: a 2.0-liter DOHC, 16 valve EcoBoost? inline 4-cylinder engine with twin independent variable camshaft timing and sequential multiport fuel injection; from a 2.7-liter DOHC, 24-valve EcoBoost? V6 with twin independent variable camshaft timing featuring Direct Injection that turns out 315 horses at 4,750 rpm while developing 350 pound feet of torque at 2,750 standard for the Sport; or from an optional 3.5-liter Ti-VCT V6 rated at 280 horsepower and 250 pound feet of torque (for SE, SEL and Titanium). All engines are mounted forward, and will mate to a six-speed SelectShift? automatic transmission with paddle shifters that gears energy to either the Front (FWD) or to all four wheels (AWD) via a full time on-demand system. AWD is available in all trim, levels with all engines. Visually, Edge displays a bold, aggressive and athletic form, adding more features and technologies that contribute to a more rewarding and engaging driving experience. Up front, the Edge leads off with a rear-sloping, three-bar grille, a horizontal lower air intake, lower side vents, wraparound headlamp assemblies and a sculpted hood. The windshield is sharply raked into a rearward-sloping roofline that flows into the angled rear glass, which is topped by an integrated spoiler lip. In profile, the Edge showcases blacked out ?B? and ?C? pillars surrounded by bright trim. The ?D? pillar or rear sail panel meets with the new LED taillamps that are accented by strong character lines. A lower composite cladding surrounds the entire vehicle. Sport model Edges come with a blacked out grille treatment and an exaggerated lower aero kit, as well as black surround trim for the greenhouse glass. 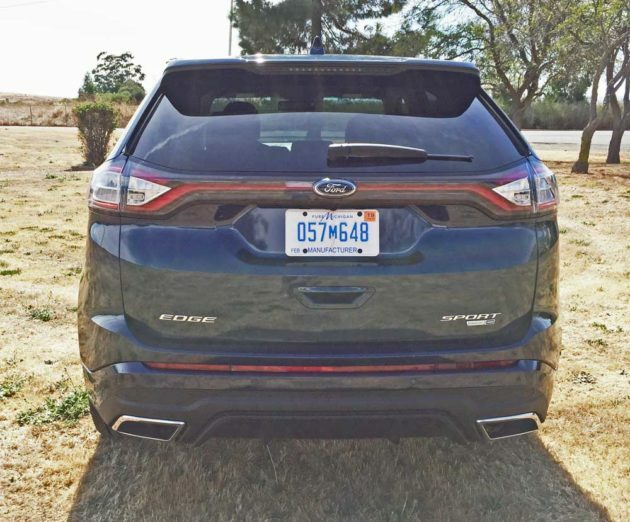 My test 2017 Ford Edge was in Sport trim and AWD, powered by the 2.7-liter EcoBoost V6. It wore an exterior finish of Blue Jeans Metallic and came with an Ebony perforated leather interior. Its base price was $40,900 while options elevated the final sticker to $46,980. Options included: Equipment Group 401A with voice activated navigation system, Blind Spot monitoring system, remote start, auto-dim driver outside mirror, Lane Departure Warning, heated and cooled front seats, heated rear seats, heated steering wheel, 180-degree front camera with washer, Enhanced Park Assist, rain sensing wipers, second row inflatable safety belts;; 21-inch polished premium aluminum wheels; and HID headlamps. 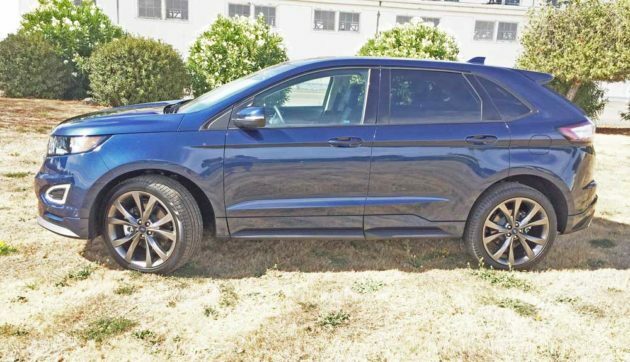 SUMMARY: The 2017 Ford Edge Sport delivers many features that are not available on many competitor?s vehicles ? 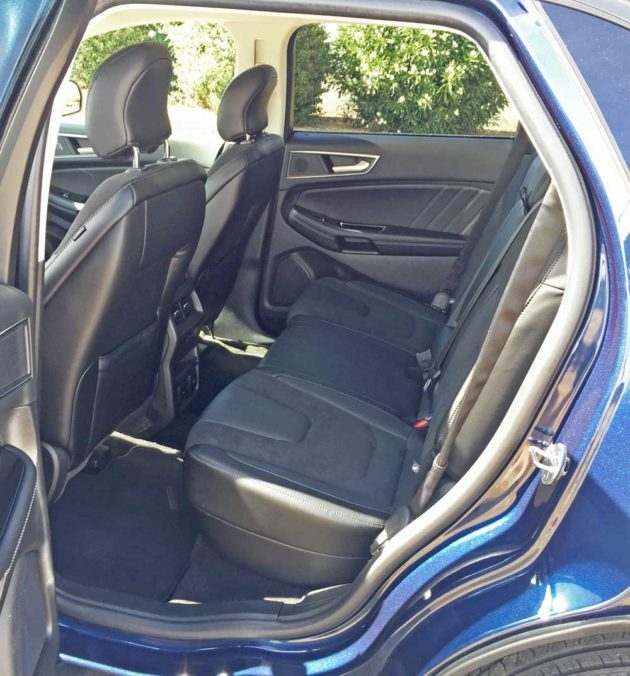 things such as; the rear lift gate which opens by waving a foot beneath the rear bumper and closes with the same action; the Enhanced Park Assist that automatically parks in both parallel and perpendicular spaces and exits the space as well without touching the steering wheel. The Cross Traffic Alert is also a big plus. 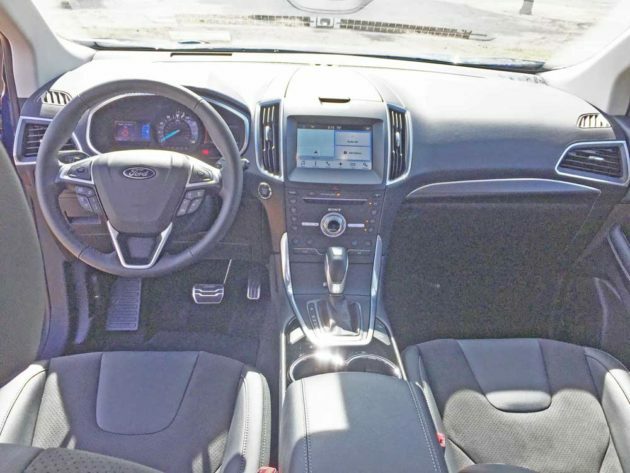 The Edge in Sport trim delivers admirable performance characteristics with its 2.7-liter EcoBoost V6 engine ? impressive acceleration, braking and handling, while providing a comfortable and stable ride. The ride quality is firmer, but not at all harsh. It is, without question, the way to go for performance junkies. The power delivery is on a par with many V8s. Safety features include: a Glove box-integrated knee airbag; AdvanceTrac? with Roll Stability Control? ; Curve Control; Dual-stage front airbags; and Ford;\?s Safety Canopy System. 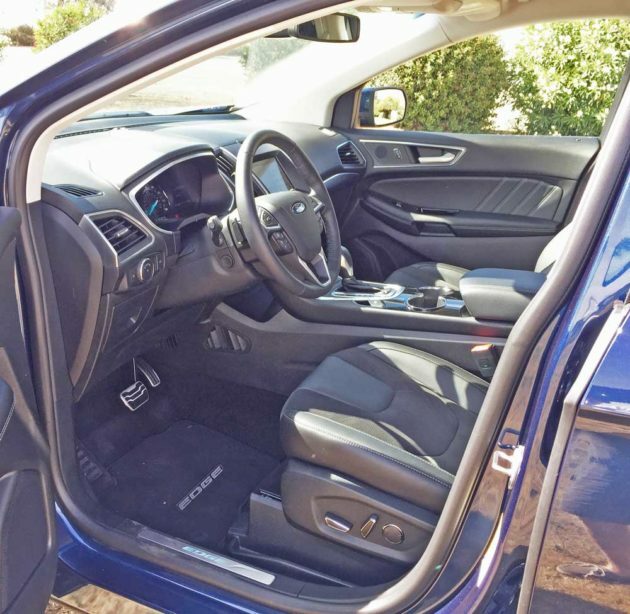 The interior devotes more attention to detail and craftsmanship, and is equally as impressive as the exterior enhancements, and in the bottom line analysis of the new Ford Edge is a Crossover worth crossing over to. Production of the Edge takes place at Ford?s Oakville Assembly Complex in Canada, near Toronto. Engine Type and Size: 2.7-liter, DOHC, 24-valve EcoBoost? V6 with twin independent variable camshaft timing and Direct Injection. Transmission: Six-speed automatic with SelectShift. Suspension: Front – MacPherson strut and L-shaped lower control arm with isolated subframe and stabilizer bar. Rear – Integral-link independent, with coil springs and antiroll bar. Brakes: Power-assisted four-wheel discs with four channel ABS and AdvanceTrac? Roll Stability Control?. Tires: Pirelli Scorpion 265/40 R21 mounted on 5-?V?-spokeGraphite painted alloy wheels. 0 – 60 mph: Not tested. Arv Voss is a Northern California based freelance motoring Journalist and member and past officer of several noted Automotive Journalist organizations who contributes regularly to a number of national and international media outlets. He reviews not only cars, trucks and SUVs, but motorcycles and unusual wheeled vehicles as well.